Mobile Pneumatic Blast Units – 1.Toušeňská s.r.o. 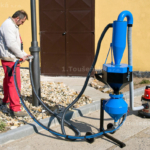 We provide these mobile blast units in number of capacity formats with pressure unit ranging from 10 to 200 litres. Smaller units are suitable especially for maintenance works, minor construction repairs, and other works of smaller range. One of the huge advantages of the mobile blast units is it mobility and easy transportability. 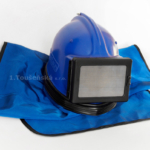 Standard equipment of these machines is also a remote control, which ensures safe operation. Every unit, regardless its size, goes with abrasion-resistant hoses. Their diameters depend on their lengths, used blast material, and nozzle diameter. 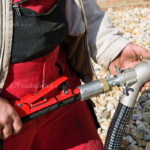 An operator is wearing a mask with air supply respiratory system as it is in pneumatic blasting rooms. 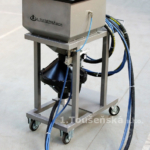 A special version of these machines is so called dustless / dust-free blaster with closed abrasive delivery system. 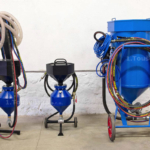 These are used for blasting of workpieces which are not removable and for blasting in premises where it is essential to avoid dusting. The nozzle is surrounded by a mask preventing the leakage of blast medium and exhausting it into the abrasive storage. 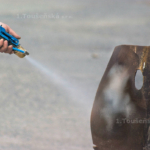 Another version of dustless blaster is sprinkler head, in which abrasive medium is used in combination with water flow in order to suppress the dust during a blasting process. Abrasive medium cannot be recycled without being dried first, so this system is usually considered convenient for cheaper abrasives such as furnace slag.